Description of "International Journal of Research December 2014 Part-7"
We are happy to announce the successful publication of this Issue of the International Journal of Research. We encourage graduate, post graduate, PhD students and other scholar from the field of science, technology, planning and management to get their paper published and share the treasure of the knowledge that you have gained. To fulfil the aim and objectives of the Open Access Journal. We have made our content freely available for researchers and scholars to access and enhance their knowledge. If you share this common view that scholarly content should be freely available and not locked up in the archives then it is time to come forward and be a part of the global mission of ensuring the publication and availability of the scholarly articles and research papers. You can come forward to present the findings of the thesis or other research work in the form of a paper and make sure that your original thoughts and views reaches of the global audience. We have provided complete guidelines for the paper content-organization, formatting of the content etc. You can access them from our website. The certificate of publication has been mailed to the authors through the email of the communing authors. We congratulate them and wish all the best for those who are going to send their article for publication in coming days. 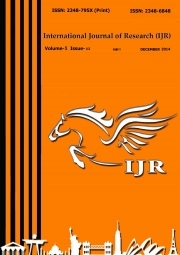 International Journal of Research, abbreviated as IJR is an international peer reviewed, internationally refereed, online, open-access journal published monthly. International Journal of Research (IJR) represents a revolution in scholarly journal publishing platform. A pioneering effort in liberal, open access publishing with fast and high quality peer review that brings journal publishing to the doorstep of every researcher and student. We believe that quality information should be free and accessible universally in this day and age. The ideology of an open-access journal is in being free for all and IJR will be free for all to read and share. IJR takes special care to publish your research paper/article without any delay. Our journal aims to bring out the latent research talent and the professional work done by Scientists, Engineers, Architects, Planners, Practitioners, Administrators, Scholars, Graduate and Post Graduate students across all fields. This journal welcomes the submission of your research papers that meet our submission guidelines and the general criteria of significance and excellence in the field of Engineering, Science and Humanities. Submitted articles are peer reviewed by our panel of experts from various fields. All submitted papers are double-checked for plagiarized content. Please note that all submissions need to be previously unpublished. Reviews of "International Journal of Research December 2014 Part-7"